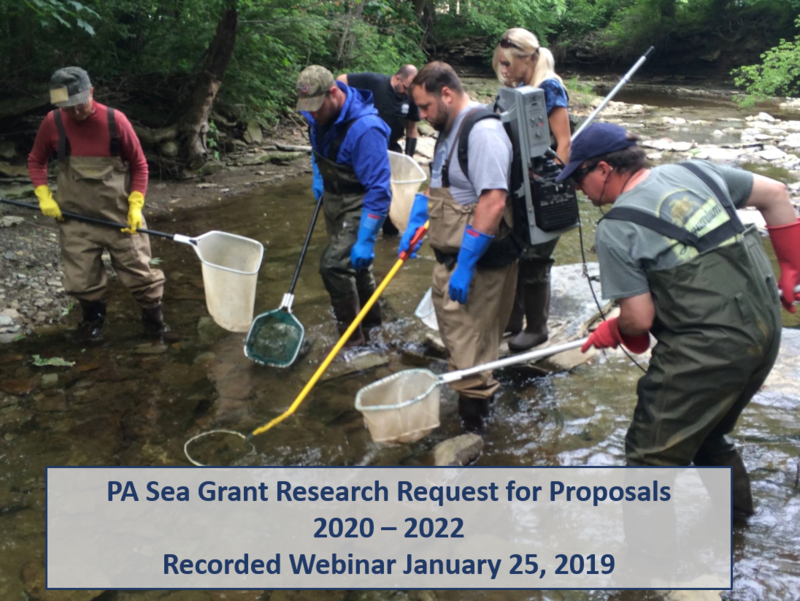 The Pennsylvania Sea Grant College Program is currently accepting pre-proposals for its next funding cycle, February 1, 2020 January 31, 2022. Only researchers who develop projects that specifically impact the Lake Erie, Delaware River, or Susquehanna River regions of Pennsylvania and address one of the priority areas will be encouraged to submit full-proposals. Projects within Pennsylvania but outside of the Lake Erie, Susquehanna River, and Delaware River watersheds may be considered if applicable to these watersheds. Principal investigators should focus on outcomes that can be achieved in a 24-month period. Proposals must include a clear outreach plan for disseminating information to targeted audiences. We anticipate funding seven to nine grants at approximately $60,000 per year per grant. A 50-percent non-federal match is required (one non-federal dollar for every two federal dollars requested). Funding requests for one-year projects may not exceed $60,000 and requests for two-year projects may not exceed $120,000. Funding is contingent upon NOAA approval and congressional appropriation of funds. Faculty members and researchers from colleges and universities, state agencies, and other Pennsylvania not-for-profit research organizations are eligible. Pennsylvania Sea Grant support is offered on an open, competitive basis. Pre-Proposal Submission: Due March 11, 2019 by 5:00 PM, EST. If you would like to be added to our Research Contact List, please send your Name, Affiliation, and Email Address to Sean Rafferty, Director of Research.